Mosaic of the surface of Titan, stitched mainly from DISR Medium Resolution Imager data, and supplemented by some High Resolution Imager data. The aim was to assemble a mosaic that shows a surface area of Titan from Huygens Images that is as large as possible. For this reason I used the earliest usable images from Huygens. These images have low contrast, because Huygens was still high in the hazy atmosphere of Titan. In the center the mosaic is partially completed by higher resolution images acquired later, to show the well known surface features, as the "Shoreline" for instance, in good quality. The red dot marks the landing site of Huygens, as calculated by ESA scientists from the latest DISR data. The scalebar in the image above is the result of two different attempts to scale the mosaic. 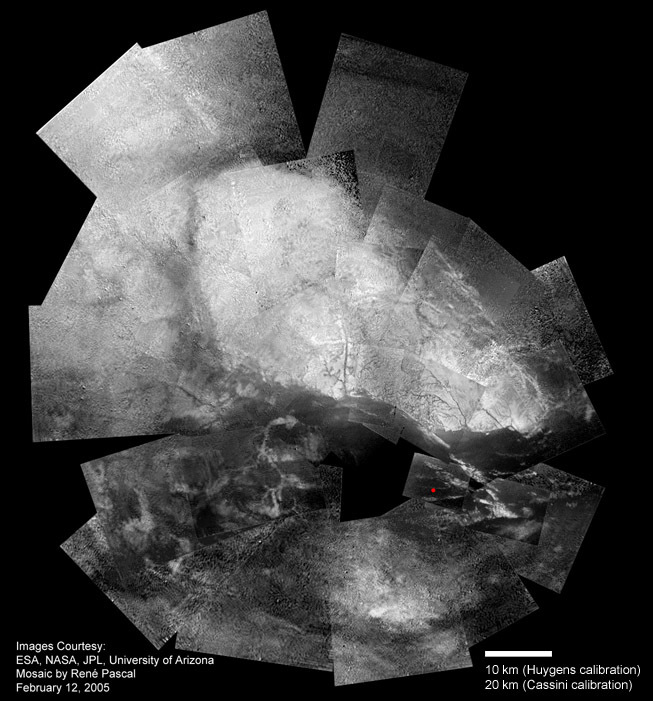 The scalebar should be around 10 km based on a calibration on Huygens DISR High Resolution Imager frame 448, that was published to have a scale of 40m / pixel. A scaling on other Huygens frames results in the scalebar to be around 8 km long. 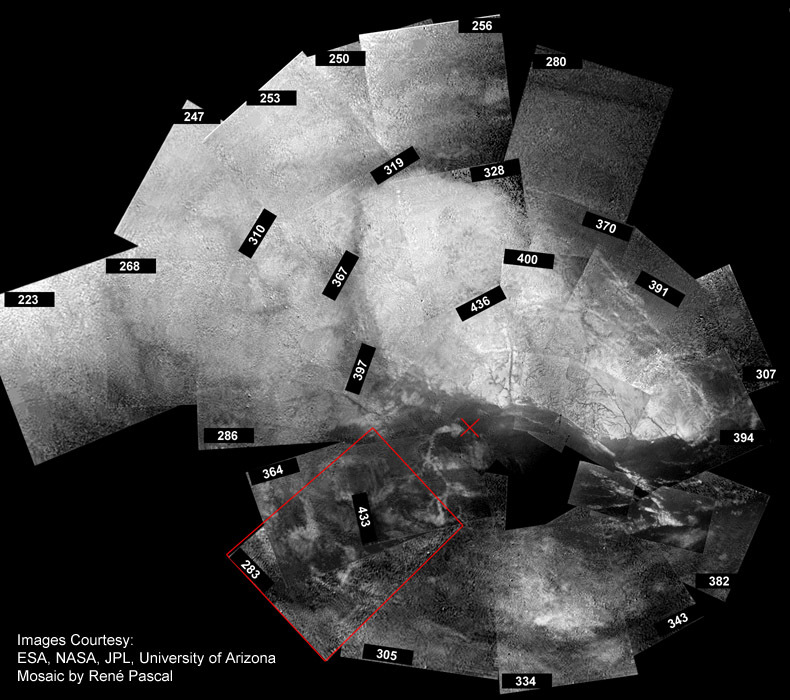 A calibration on the Cassini ISS images (see below) on the other hand results in the same scalebar being 20 km long. This calibration bases on the assumption that the correlation between the Huygens Mosaic and the Cassini ISS Images below is correct. The Large Suface coverage mosaic with labels which frame was used in what location, so my positional arrangement and photometric representation may be checked for correctness. Sorry for the delay, originally I wanted to publish this somewhat earlier. For frame 283 the DISR MRI footprint is shown; the cross marks the position above the ground Huygens was located at the moment this frame was obtained. By finding this position for all frames, Huygens horizontal drift path may be reconstructed; nick and roll movements of the probe will introduce errors in this reconstruction. I am not shure about the correctness of its position, maybe it is to be located slightly further to the right (east). The position of this frame is best found with help of frame number 262 (not shown). I only inserted some of them, especially for the prominent shoreline and the landing site. Labels are only shown for the outer frames where the positional correlation is more difficult.